– / Bell 26., MacDonald 66. 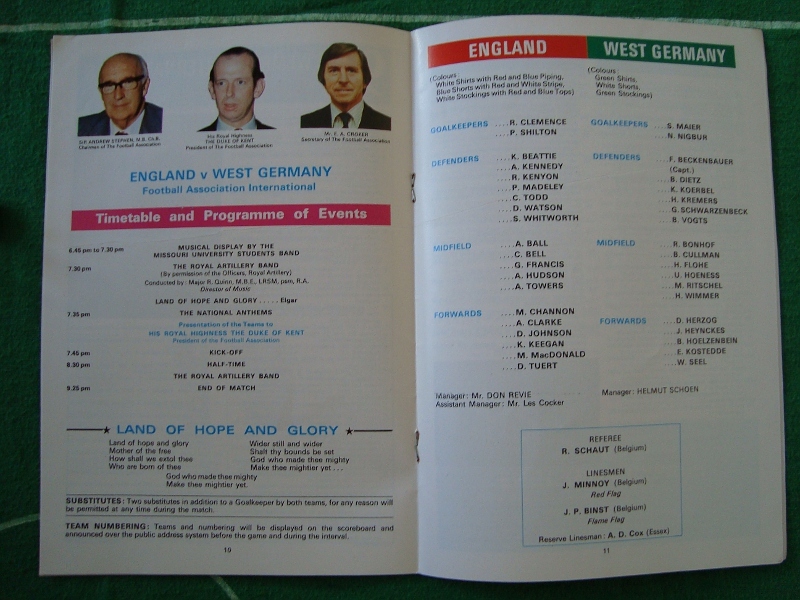 Marking the 100th fixture at Wembley Stadium, the commemorative official match programme for the 1975 friendly was surprisingly light in content, consisting of only eighteen numbered pages in colour. Slightly larger than A5 size, it cost twenty pence and featured an image of the famous Wembley twin towers. 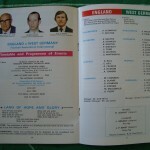 Contents included an interview with England manager Don Revie, a short article on Wembley’s centenary and a list of the previous ninety-nine games, as well as the usual team lineups and pen-portraits. 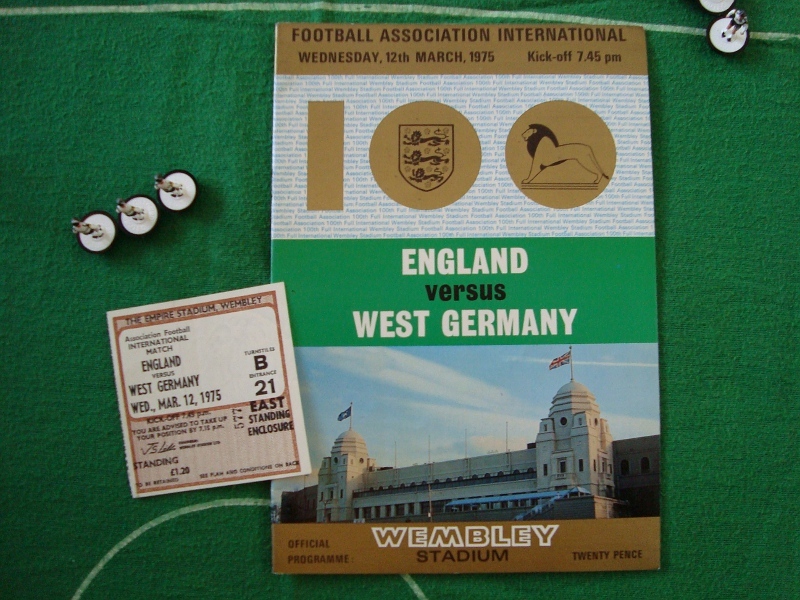 When England entertained Germany at Wembley in March 1975, the Nationalmannschaft were both European and World Champions, while the Three Lions were still struggling to come to terms with being relegated to the status of footballing also-rans. While the Germans had been stocking up their trophy cabinet with valuable international silverware, England had followed up their quarter-final exit in the 1972 European Championships with elimination in their World Cup qualifying group at the hands of Poland. Having lost to the Poles 2-0 in Chorzów, they had to win at Wembley in the return fixture to qualify for the tournament in Germany, but found themselves thwarted by the heroics of Polish ‘keeper Jan Tomaszewski, who had earlier been called a “clown” by Brian Clough. The 1975 fixture was Wembley Stadium’s centenary international, and things appeared to be looking up under new coach Don Revie, who had taken the helm following the sacking of Alf Ramsey and a seven-match spell under caretaker manager Joe Mercer. The team had a fresher look to it, and had already started off their qualification campaign for the 1976 European Championships in a positive vein with clean sheets against Czechoslovakia and Portugal. 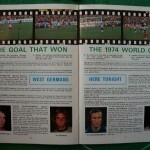 As reigning World and European Champions Helmut Schön’s Germany had little or nothing to prove, and arrived at Wembley with a rather weakened side. A number of key players had decided to retire from international football after the World Cup, among them Jürgen Grabowski, Wolfgang Overath and the biggest name of all, Gerd Müller: having scored a record sixty-eight goals in sixty-two internationals, Der Bomber’s decision to end his career in 1974 at the relatively young age of twenty-eight had taken many by surprise. Müller’s skill, presence and unrivalled poacher’s ability would be sorely missed as Helmut Schön set about reshaping the squad. In the three games Germany had played since the World Cup against fairly ordinary opposition, the offensive line had hardly made their opponents quake in their boots: A scratchy 2-1 friendly win in Switzerland had been followed by a lucky 2-2 draw in Greece in their opening European Championship qualifier, and then a truly painful game in Malta which was settled by a single Bernhard Cullmann goal late in the first half. Among the newer faces was the twenty-eight year old Kickers Offenbach forward Erwin Kostedde, the first black player to line up for the Nationalmannschaft – some three years before Viv Anderson would make his international bow for England. Without the recently-retired Müller, Germany’s forward line had a distinctly unpolished look to it: joining Kostedde would be Bernd Hölzenbein and makeshift forward Herbert Wimmer. England started off the brighter of the two sides, with the stylish young debutant Alan Hudson making his presence felt early on. Shorn of the powerful Grabowski and the intelligent Overath, the German midfield looked far less imposing than it had been in previous years; the spine that sat behind the midfield also had a different shape to it, with skipper Franz Beckenbauer partnering twenty year-old Karl-Heinz “Charly” Körbel instead of old head “Katsche” Schwarzenbeck who was on the bench. Right from the start, it was clear that Schön’s side had little to offer on what was a damp and slightly depressing Wembley evening. 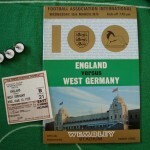 The midfield was sluggish and a far cry from the dynamic engine that had terrorised the England defence during their last visit to Wembley; Franz Beckenbauer was unable to press forward with any level of confidence and the obvious lack of firepower up front only served to illustrate just how important Gerd Müller had been to Helmut Schön’s side. The home team would make much of the running, with the midfield being bossed by Southampton’s Mick Channon and Stoke City’s debutant Alan Hudson; Hudson was continually moving at pace down the left flank and cutting inside, while Channon showed some great just outside the German box, setting up skipper Alan Ball whose weak shot was easily collected by Sepp Maier in the German goal. With just over twenty-five minutes gone Leicester City right-back Steve Whitworth – also making his international debut – played a neat one-two with Malcolm MacDonald before being upended by centre-back Bernhard Cullmann to the right of the German box about five yards from the byline. The resulting free-kick was floated into the penalty area by Hudson, where it evaded three German defenders to fall at the feel of Colin Bell. Bell’s rather weak volley took a nasty deflection off the back of Manfred Ritschel, and made its way into the back of the net with Meier left completely flat-footed. It was arguably a lucky goal, but the home side clearly deserved their lead. With twenty-six minutes gone England seemed set fair, as their opponents didn’t appear to have either the willingness or the ability to make any sort of impression on the game. Perhaps Helmut Schön didn’t want his team to play party-poopers on Wembley’s 100th match celebrations, but I can be honest and say that the ten minutes or so of highlights I have seen of this game has never tempted me to seek out the full ninety minutes. The Germans could very easily have used the rapidly deteriorating playing surface as an excuse, but this clearly wouldn’t have washed when the opposition were somehow able to put together a number of neat and swift passing moves. 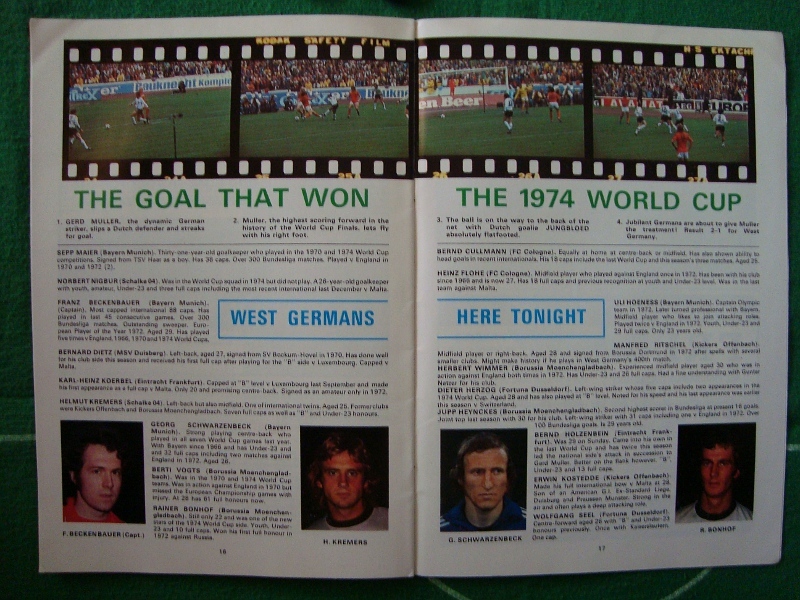 When Cullmann was caught dithering on the ball just inside his own half by Kevin Keegan, the squat and big-haired number eleven charged forward and played the ball out to MacDonald on the left, whose cracking left-footed shot from just outside the penalty area was well saved by Maier. With Helmut Schön’s side unable to make any headway in midfield England’s confidence increased – in particular Hudson, who was now starting to pop up and cause havoc all over the field. Some fine play on the left saw the Stoke City man skip past the static Rainer Bonhof and thread the ball through to Channon who had a good shout for a penalty, and minutes later he was engineering an attack that saw him move almost the entire length of the pitch down the right flank. Having blocked Heinz Flohe’s shot just outside his own penalty area Hudson combined with Bell and charged forward, picking up the ball again inside the German half out on the touchline before threading a pass between two green shirts for MacDonald, whose left-footed curler from the edge of the box flew narrowly over Maier’s crossbar. Germany’s first genuine attack came in the minutes before half time, when Bonhof found enough space down the left two swing in a cross that was deflected towards the England goal, forcing ‘keeper Ray Clemence to dive to his left. As the teams went in at the break, the men in green were perhaps lucky not to have been further behind. The second half followed much the same pattern as the first, as england continued to lay siege to the German goal. Mick Channon was again heavily involved, skinning the unfortunate Bonhof down the right and setting up an attack that was quelled only when striker Kostedde lumped the ball behind for a corner. A neat series of crisp passes led to a Colin Bell effort that was gathered by Maier, and England were unlucky not to double their lead when Bell screwed his shot narrowly wide of the far post after Cullmann and Bonhof – neither of whom had covered themselves in glory – contrived to needlessly give the ball away in their own half and Maier had only managed to parry MacDonald’s snapshot. There woule be a sense of inevitability about England’s second goal, and it finally arrived courtesy of “Supermac” McDonald with sixty-six minutes on the clock. Having been fouled halfway inside the German half by the right touchline by Bonhof – yes, him again – Channon took the free-kick quickly, finding Alan Ball who charged towards the byline and floated a high looping cross into the German box. Maier flapped at the ball but couldn’t get there, and the unmarked MacDonald arrived at the far post to nod it in from a yard out. It was Supermac’s first goal for England in what had been an on and off career, and he would score six in all – the remaining five all coming in the European Championship qualifier against Cyprus the following month. England’s 2-0 victory over the reigning world champions led to a new wave of optimism, but looking at it now it is hard to see how anything could have been taken away from a game against a German side in transition that had clearly been going through the motions. And so these dreams of a great England revival proved to be a false dawn: while Helmut Schön was able to put things back together again and take his team to a second successive European Championship final the following year, the Three Lions went into their final qualifying game against Czechoslovakia in Bratislava needing only a point to progress to the quarter-final playoff. Despite taking a twenty-sixth minute lead, Don Revie’s side ended up losing 2-1. Having pipped England by a single point, the Czechs who would go onto reach the final itself – where they would beat the defending champions in an historic inaugural penalty shootout. Germany and England would next meet three years later in 1978, and the relative fortunes of both sides would remain much the same. While Helmut Schön would find himself looking towards the end of a long and celebrated career, England would be recovering from yet another failure to qualify for a major tournament – and setting out on yet another new path with yet another new manager. Home: played 9, won 1, drawn 3, lost 5. Goals for 11, goals against 23. Overall: played 17, won 3, drawn 3, lost 11. Goals for 20, goals against 48.